Well, here we are; another year. 2009 sounds strange. A new year always has sounded weird to me. We’ve spent a year saying 2008, and now with the tick of a clock, we’re no longer in that year. I’ve done well the past few years not writing the wrong year on checks. Today was a total vegetate day. It’s Jean’s birthday today, and we spent it in a state of semi-concsiousness in front of some bowl games. I’ll be hitting the South Beach diet trail again after two months of reckless indifference toward what I’ve been eating. Oh yeah exercise too. Mid January, My step-mom, Alice will be celebrating her 90th Birthday. We’ll join her down in Mesa Arizona. Right now, I’m focused on this weekend’s Saturday Night Life. After not having a show in December due to The Joy to the Children production, I expected to have it all together. Yeah right! 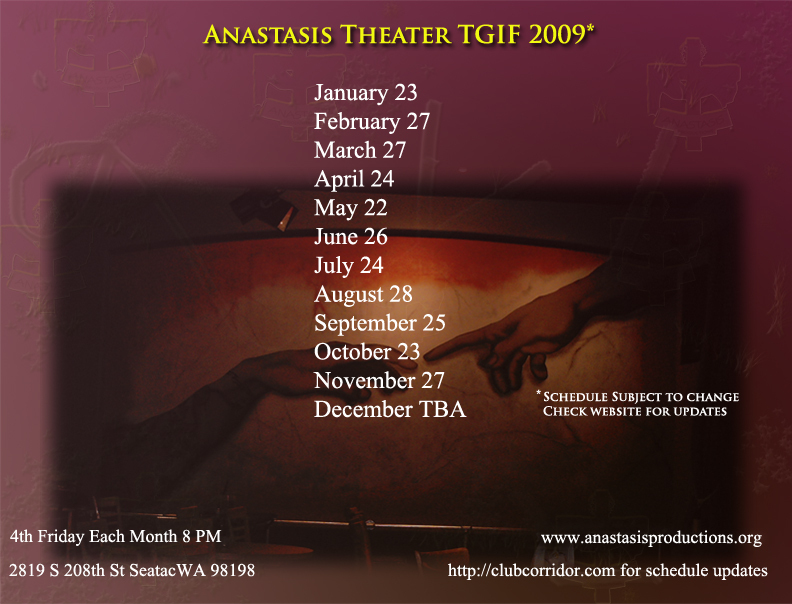 January also marks something new for Anastasis Theater. 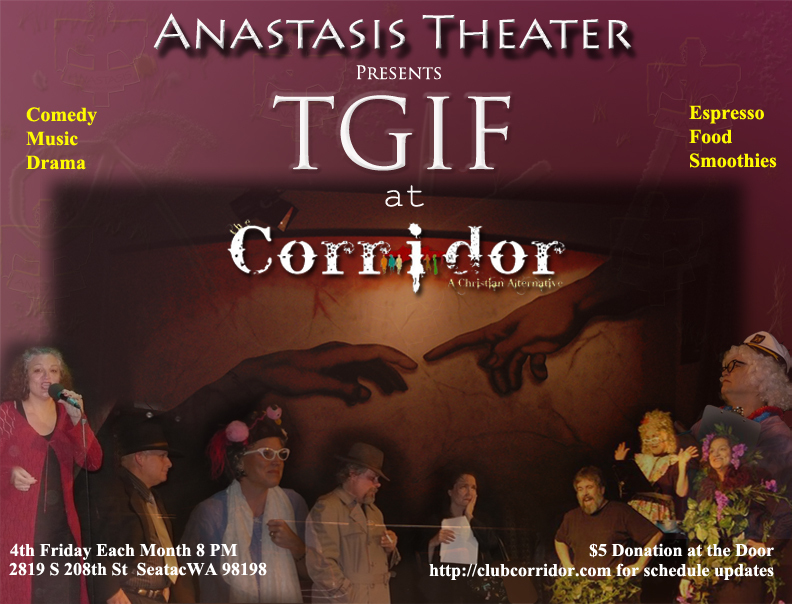 Beginning the 23rd of this month we will be doing a TGIF show at the Corridor, in SeaTac, on the 4th Friday of the month. This will be a unique blend of music, comedy, and drama that will bring a smile to your lips, a tear to your eye, and bounce to your step. It’ll be a good year. This page took 0.698 seconds of computer labor to produce.